We woke up bit early; had heavy breakfast as usual. For today I have already decided to go to Botanical garden in first half of the day. So took a cab from hotel and I figured it was very nearby. 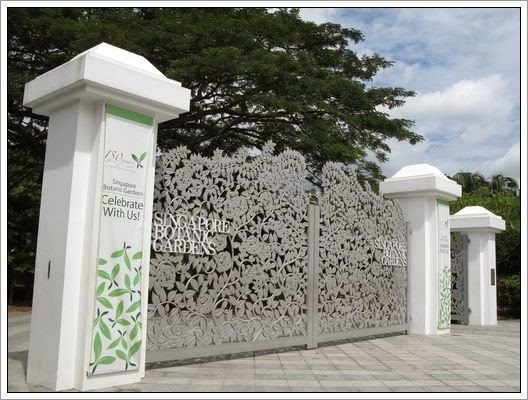 This botanical garden is must if you want to see the greenery and variety of plants and flowers they have. Excellent maintenance, people come here for jogging, picnic and touristy purpose. They have one section of National orchid garden which is just awesome. After strolling for few minutes I realized that battery of my camera has not been charged for past 2 days and unfortunately after a while in major area of Orchid garden my camera stopped working. 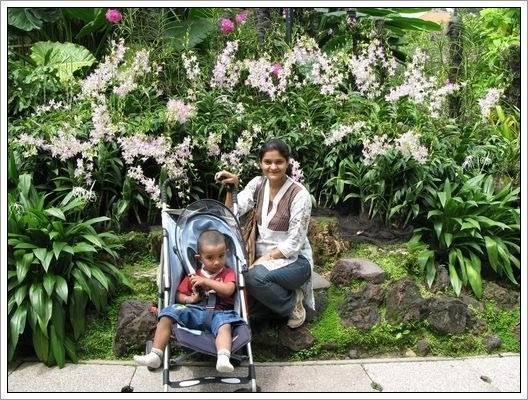 With orchid garden they have number of mini- attractions. I couldn't take any photo of mist house, cool-house. Other than that they have rain-forest, ginger garden, evolution garden. Then they have 3 lakes: Swan Lake, Symphony Lake and Eco Lake. Then even have French restaurant and cafeteria in the garden. It takes at least more than 2 hrs. to complete round of the garden. At certain places they have flight of stairs where I have to carry Aarush as well the stroller up and down. Otherwise, overall pavement is very good for kids in stroller and handicapped people. I decided to return by public bus so got down at orchards street close to hotel. Went to hotel room put the batteries in charger. Meanwhile we freshened up, fed my son and put him to sleep. Then around 4.00pm I took metro while he was still sleeping and went to Raffles place by MRT. From here I walked towards boat quay seeing parliament, supreme court, city hall building and Saint Andrews cathedral on the way. My objective was to see Merlion. So walked all the way on the riverside lined with restaurants basically hangout for expatriates and tourists with chic cafes, yuppie pubs. Here every restaurant employee tries to persuade you to come in. While strolling saw structure of arts along the river which was amazing. Walked all the way till the back of The Fullerton hotel then crossed highway to go to other side i.e., one Fullerton to Merlion park tourist icon of Singapore. As located next to marina bay on city's edge it has seating arrangement to view Esplanade, sea and bum-boats to give tourists a tour of Colonial Singapore from the river. Me and Aarush sat there relaxing my feet after a hard day of walking. It was about to sunset & weather was very pleasant, chill air blowing. While sitting there I was gazing people from different corners of world coming and posing with Merlion. One big Japanese group came; and they were posing like anything and I couldn't control laughing all alone; truly had a fun time. 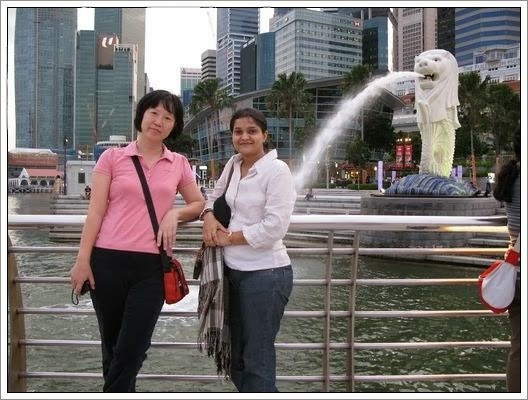 After a while I realized that we too also became tourist icon with Merlion as some of those Japanese women in late 40s wanted to have picture with me and Aarush (taklu baby) too. Well, with the fall of day-light statue is floodlit and water pours from the statue's mouth. Fortunately we spent quite a lot of time there as it was today’s end point. Around 8 Santanu met us there and we left for dinner by cab to Little India. 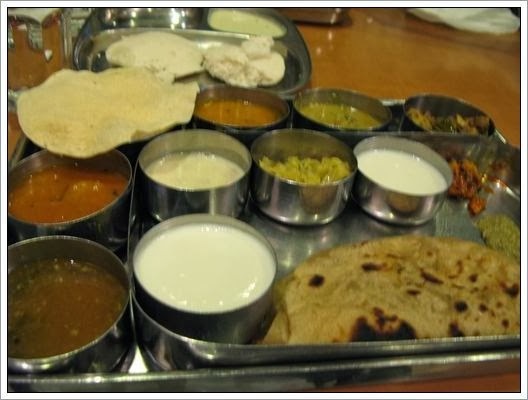 Today we had south Indian thali; portion of food was too much to eat then we walked to Mustafa known shopping complex open 24 hrs. I believe They mainly serve tourists from India, Middle East, South-east Asia and Africa other then Europeans and Americans. They have wide range of items from pin to piano thronging with narrow aisles. Staffs don't respond properly except in diamond-gold jewelery section and most of them can't speak simple English neither they have product knowledge. Its heavily crowded even at 12.00AM.After a while I started feeling dizzy due to claustrophobia. Then quickly bought few stuffs and headed back to hotel via public bus.